Encaustic painting, also called "hot wax painting", involves using heated beeswax to which colored pigments are added. The liquid/paste is then applied to a surface; usually prepared wood, although canvas and other materials are also used.. The simplist encaustic mixture can be made from adding pigments to beeswax, but there are several other recipes that can be used; some containing other types of waxes, damar resin, linseed oil, or other ingredients. Pure, powdered pigments can be purchased and used, or some mixtures use oil paints or other forms of pigment. 1. A gradual oxidation from exposure to air and moisture, as in the decay of old trees or of dead animals. 2. A slow combustion taking place in the presence of air and water, and accompanied by a kind of fermentation. 3. The slow decomposition of organic matter. Relating to the use of galvanic (dynamical elecricity) heat as a caustic, especially in medicine. Cautery processed by a knife or needle heated with the passage of a galvanic electrical current. The sacrifice and burning of a horse. 1. A great or complete devastation or destruction, especially by fire: Several examples of holocausts took place in California and some other states during 2014. 2. A sacrifice completely consumed by fire; burned offering: Historical records reveal that many religions in the past used a form of holocaust when they sacrificed animals to their gods. 3. The systematic mass slaughter of European Jews who were placed in Nazi concentration camps during World War II (usually preceded by "the" and capitalized; such as, The Holocaust). 4. Any mass slaughter or reckless destruction of life: Totality of destruction has been central to the meaning of holocaust since it first appeared in Middle English in the 14th century, used in reference to the biblical sacrifice in which a male animal was wholly burnt, or cremated, on the altar in worship of God. 5. Etymology: from Greek holokaustos, "that which is completely burned", which was a translation of a Hebrew word, literally, "that which goes up", that is, "in smoke". In this sense of "burnt sacrifice", holocaust is still used in some versions of the Bible. In the 17th century the meaning of holocaust broadened into "something totally consumed by fire", and the word eventually was applied to fires of extreme destructiveness. In the 20th century, holocaust has taken on a variety of figurative meanings, summarizing the effects of war, rioting, storms, epidemic diseases, and even economic failures. Most of these terms came into existence after World War II, but it is unclear whether they resulted from the use of holocaust in reference to the mass murder of European Jews and others by the Nazis. 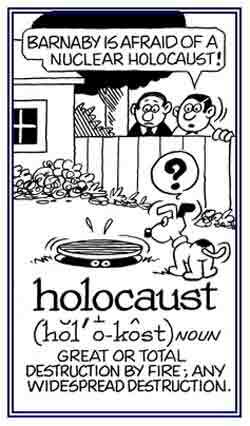 This application of the word occurred as early as 1942, but the phrase The Holocaust did not become established until the late 1950s. New York; 1997; page 333. Like the holocaust or a reference to the term generally used to describe the genocide of approximately six million European Jews during World War II, as part of a program of deliberate extermination planned and executed by the National Socialist German Workers’ Party (Nazi) regime in Germany led by Adolf Hitler. Also used instead of hypocaust; that is, a reference to "underfloor heating". The air was heated by a furnace (outside the rooms) and once it had circulated underneath the flagstone floors, it escaped via flues in the walls of the rooms, or spaces in the walls, for heat to travel upward. Evidence of Roman central heating was found by archaeologists digging at the site of the old Head Street Post Office. The heating system, called a "channelled hypercaust", was unearthed by diggers working on the site for the Colchester Archaeological Trust. It proves that nearly 2000 years ago, Roman citizens of Colchester were warming their toes (trouble-free) in the coldest of winters. Archaeologists were taking out a lot of material from the destruction of the town by Boudica which included the remains of walls and foundations. The whole site was being converted into a cinema, but must be investigated first because it sat in the center of Britain's oldest recorded town. It was thought to be part of the same building as a bath complex found earlier at the site and worked by drawing hot air from a fire under the floors of the buildings. The heat was transferred to the floor and could be felt in the room. It was a dirt and smoke-free method of heating a room long before electricity. —Excerpts from Echo, July 30, 2000; "Colchester: Roman heating system found". In architecture, an open space below a floor to allow the passage of hot air and smoke in order to heat the room above. This type of heating was developed to a high degree by the Romans who used it not only in the warm and hot rooms of the baths, but also almost universally in private houses in the northern provinces. Many examples of such hypocausts exist in villa and house foundations in Roman centers in Germany and England. The usual custom was to lead the smoke from a hypocaust into a single vertical flue through which it escaped into the open air. The word comes from Latin hypocaustum, and previously from Greek hypokauston and ultimately from Greek hypokaiein, "to light a fire beneath". 1. A permanent black ink made of lampblack and blue binder; some varieties are waterproof which is used for printing or writing or drawing. 2. A nearly black pigment brought primarily from China, which is used for water colors. It comes in rolls, or in a square, and consists of lampblack or ivory black plus animal glue. 1. A black or colored liquid used for writing, drawing, or printing on paper or other writing surface. 2. A black liquid produced by some sea animals; such as, the octopus, cuttlefish, and squid in order to distract predators. From an organ, found in most cephalopods, containing an inky fluid which can be ejected from a duct opening at the base of the siphon. The purpose of the ink-fluid is to cloud the water and it provides and opportunity for these animals to escape from their enemies. 3. Etymology: from Old French enque, "dark writing fluid"; from Late Latin (about 300 to about700 A.D.) encaustum, which came from Greek enkauston, "purple" or "red ink"; used by the Roman emperors to sign documents, originally a form of enkaustos, "burned in". The term enkaustos came from the stem of enkaiein, "to burn in"; from en, "in" + kaiein, "to burn"; based on Latin causticus, "burning, caustic"; from Greek kaustikos, "capable of burning" and from kaustos, "combustible"; from kaiein, the Greek element meaning "to burn". An electrocautery (electrosurgery) in which an electric current is applied through a hand-held active electrode and travels back to the generator through an inactive electrode attached to the patient (the grounding pad), so that the patient is part of the electrical circuit. Showing page 3 out of 4 pages of 52 main-word entries or main-word-entry groups.